I am happy to report that the first Guideline Bootcamp in British Columbia was a great success. 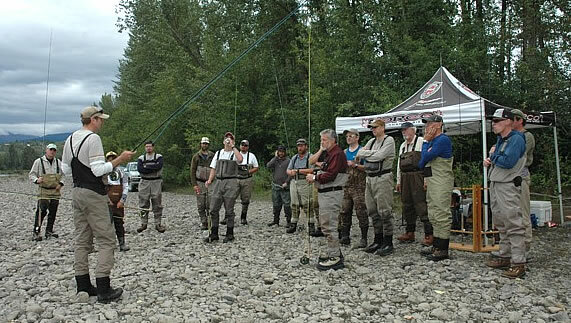 A very good turn-out of spey bros from all levels of experience and ranging in ages between 12 and 70 showed up for a day of casting demonstrations and to try out various Guideline rods . The location: the Bulkley River in Smithers, the most productive steelhead river of the Skeena system and famous for it’s dry fly fishing. 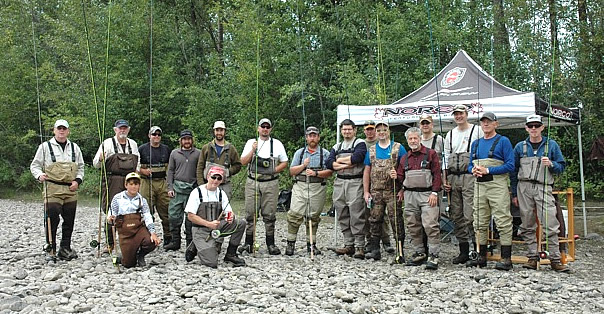 The local Guideline dealer in Smithers, McBike’s had organized the event and set up a tent on the bank of the river. Luckily the weather gods were on our side and the day was a pleasant overcast one without much wind. The program for the day consisted of a broad range of casting demonstrations, single hand spey techniques, spey basics, water born vs air born casts, skagit vs scandinavian style casting, etc. It was a lot to take in for all present but with a full day to try out a wide variety of Guideline lines and rods there was enough time between sessions to practice and get some help with casting or tackle questions. The crisp, light, scandinavian style rods from Guideline generated a lot of interest. McBikes provided refreshments and lunch. At the end of the day we did a little fly tying session utilizing the FITS tube system as well as instruction on loop welding and how to determine the right head weight and length. All in all it was a wonderful day on the river. Many thanks to all who attended and to Sam from McBike’s for making this day a success, and let’s hope that we can make this into a yearly event.